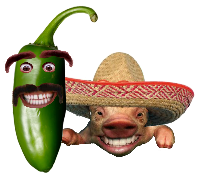 BBQ tip's, tricks and information via Video Blog. Kick back with a beverage and relax. It's show time! 3-18-2012 - At $39.99, The new pellet fired Amaze-N-Smoker cold smoke generator is the #1 bang for the buck when it comes to BBQ accessories. Watch and see why. 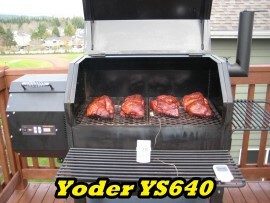 3-10-2012 - Tips on cold smoking, some nice smoking racks and some great Wasabi almonds, pepper jack and cheddar on the Yoder Wichita using the AMAZE-N-SMOKER burning apple wood pellets. 3-7-2012 - See what's in the FedEx box I received march 5th as I do the un-boxing. I will be doing the review on this soon. 2-27-2012 - February's Free Gift Certificate drawing. Join me on my Honda Goldwing for wild ride up MT Rainier through snow, wind, and freezing rain. I will go to extremes for my viewers and to support our troops. You can help! 2-24-2012 - If you have been fighting creosote buildup in your pit and a nasty bitter aftertaste on your foods, this video is a must see for you stick burners. This video will demonstrate how to build and maintain an efficient fire. No more billowing white some. We are after the elusive "Thin Blue Smoke" that will produce pit master results. 2-23-2012 - Tired of that black gooey creosote buildup in your pit? In this video I will demonstrate how to quickly and easily remove it so your pit is clean and ready for your next stellar slow cook.